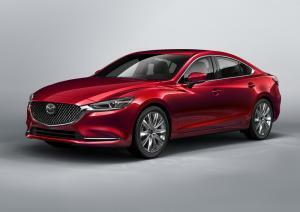 At the LA Motor Show today, Mazda unveiled the 2018 model year Mazda6. It includes a number of changes geared towards a more upmarket shift in the company’s products, a strategy dubbed ‘Mazda Premium’. 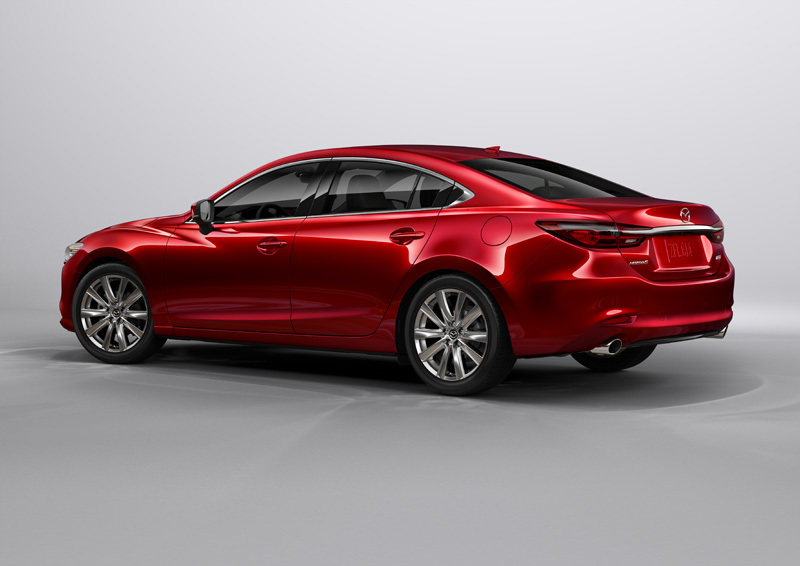 From the outside, the changes at first glance appear minor – the Mazda6 receives a new grille, similar to that on the new CX-5, while the headlights have been re-styled and now incorporate the fog-lights. Soul Red makes its first appearance on the ‘6 in the US market, while both 17- and 19-inch alloy wheels feature new designs. More obvious, however, are the changes to the interior, with the company claiming only the steering wheel and a few small pieces of trim have been carried over from the previous model. The dashboard has a far more horizontal layout, with materials on range-topping models set to include Nappa leather, UltraSuede and Sen wood. 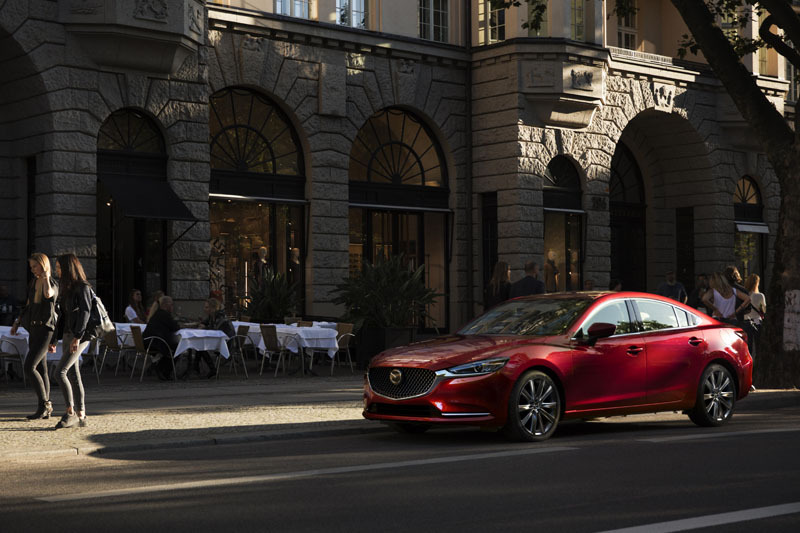 The seats are now wider, and are constructed from a more supportive high-density foam for increased comfort, while electric ventilation arrives as an option for the first time on a Mazda. 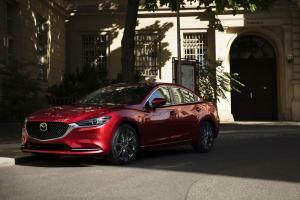 Elsewhere, the instruments include a 7-inch TFT display on high-spec models, Mazda’s Connect infotainment system receives a new 8-inch display with improved contrast, and there’s a new 360-degree parking camera system. 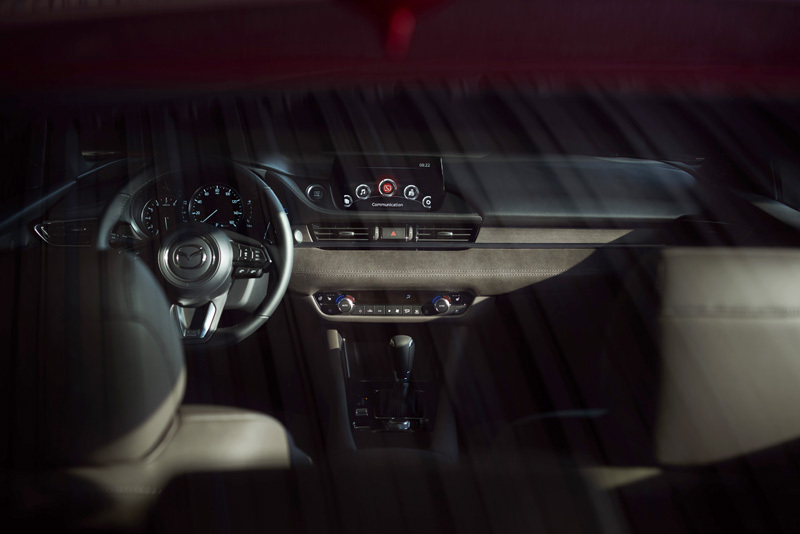 Mazda’s Radar Cruise Control has been updated and can now bring the vehicle to a stop in slow-moving traffic, pulling away again as necessary, while the familiar head-up display now projects directly onto the windscreen. There’s also a new windshield wiper de-icer. A new 2.5-litre four-cylinder engine with cylinder de-activation will join the existing engine line-up – at speeds between 25 and 50mph, the outer two cylinders can shut down to conserve fuel, with Mazda claiming the transition is imperceptible. A turbocharged version of the same engine, as seen in the CX-9, will also arrive in the US, but is unlikely to make it to UK shores. 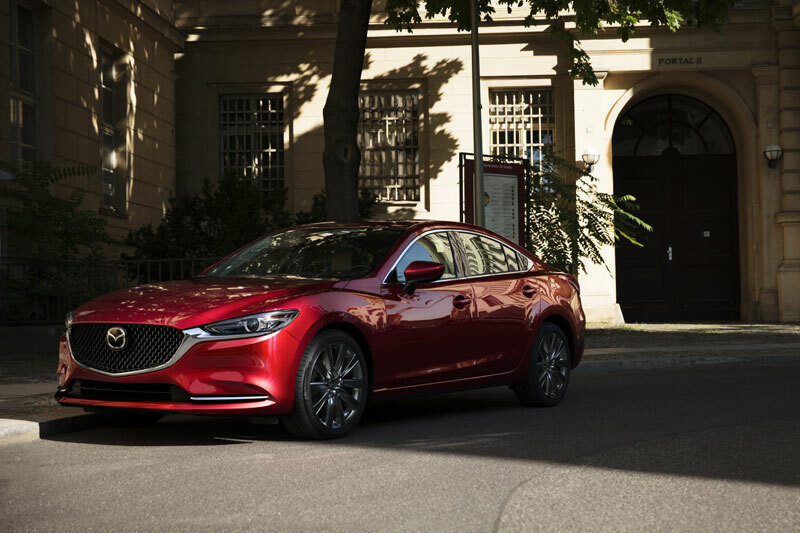 It carries a number of features to increase responsiveness and efficiency, including Mazda’s Dynamic Pressure Turbo that uses a small inlet port to build pressure in the turbocharger quickly, thereby reducing lag. The result is an impressive 250hp and 310lb/ft of torque on premium fuel. 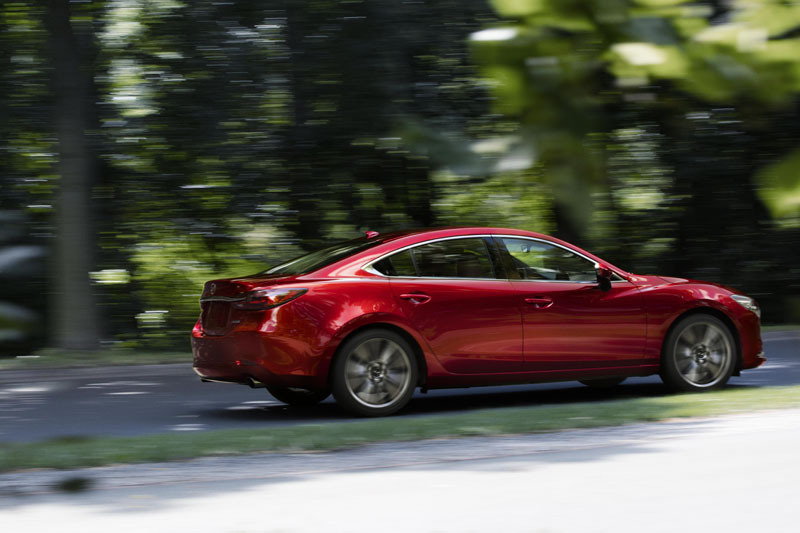 As standard, this SkyActiv-G 2.5T engine is mated to a new six-speed automatic transmission that keeps its torque converter locked as much as possible. Taking advantage of this new powerplant, Mazda say their engineers altered nearly every part of the Mazda6’s chassis to optimise its performance – the steering rack is now rigidly mounted to the chassis for increased feel, structural elements within the bodyshell have been reinforced, and the chassis’ set-up revised to offer a more dynamic response with less body-roll. These changes have had the additional benefit of creating a smoother ride, the company says, while also reducing noise transmission into the cabin for a quieter, more refined experience. The new 2018 Mazda6 is expected to go on sale in the UK from the summer.